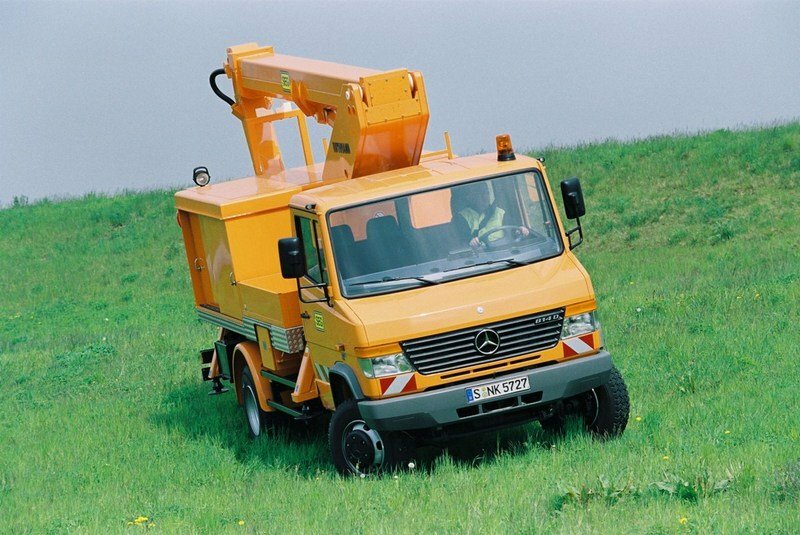 The Mercedes Vario is one of the most versatile vehicles built by the German manufacturer. 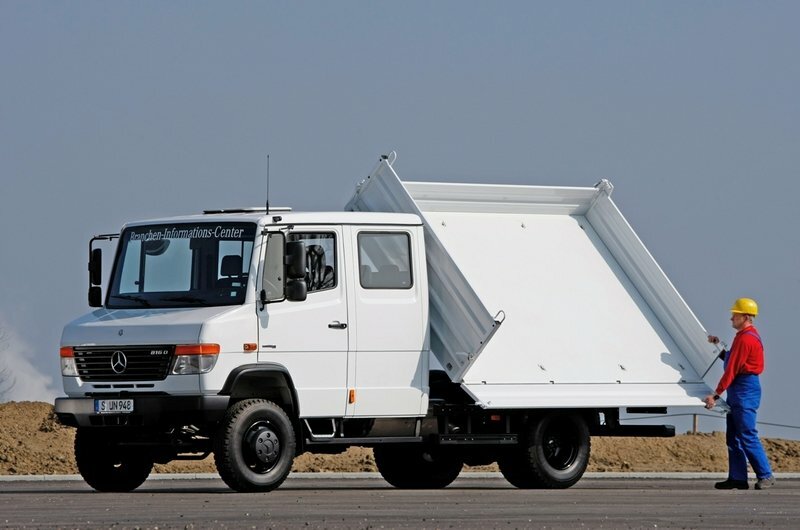 The Vario can be used for a wide range of commercial and construction purposes and is available in many variants which include panel van, box body, tipper pickup and even bus. There are also two cab configurations available which include the standard and the crew cab models. The model was introduced back in 1986 when it was originally named the Transporter 2. 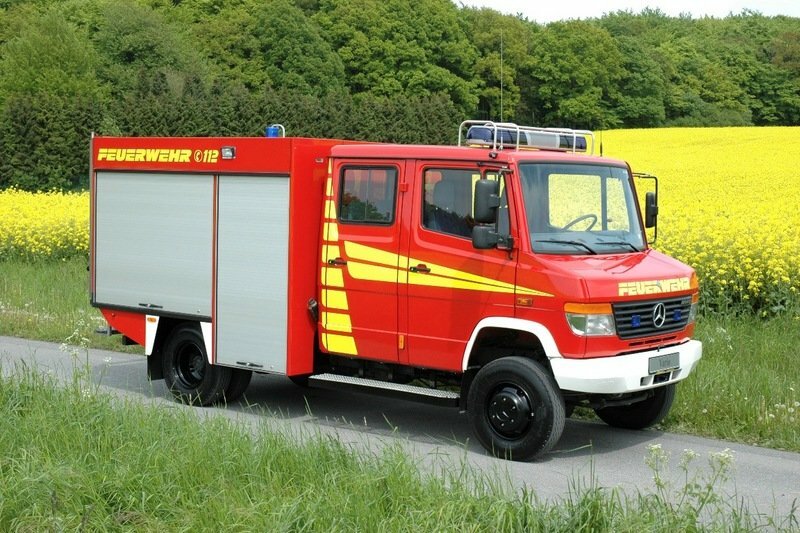 The vehicle received the name Vario in 1996 and since then it was continuously improved and upgraded. The Mercedes Vario has a starting price of $55.550 and is equipped with a 4 cylinder diesel engine which meets the latest Euro 5 emission standards being among the most fuel efficient units in its class. 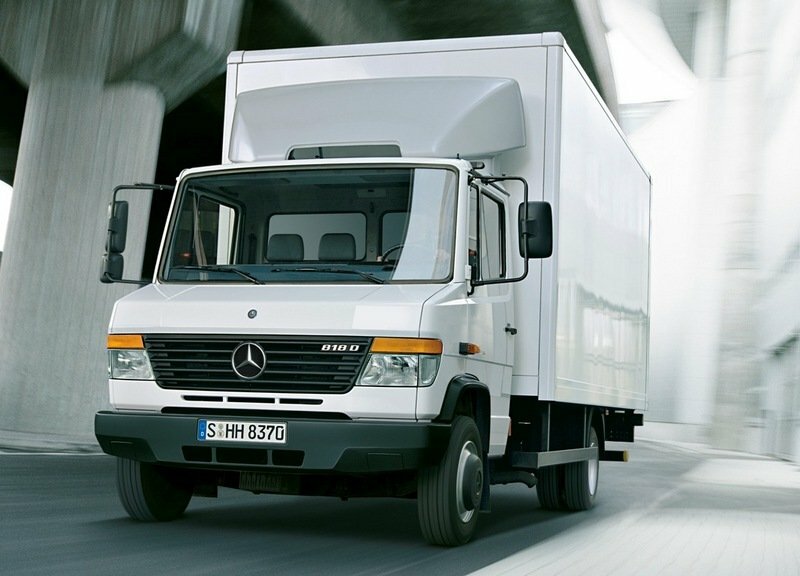 Judging by today’s standards the exterior design of the Mercedes Vario Chassis cab is a bit dated. The cab over engine configuration gives the vehicle a rugged look which is enhanced by a boxy overall design. The front features an extremely short nose combined with a black radiator grille that bares the three pointed star in its center. The headlights are also pretty simple and don’t have any fancy design lines. 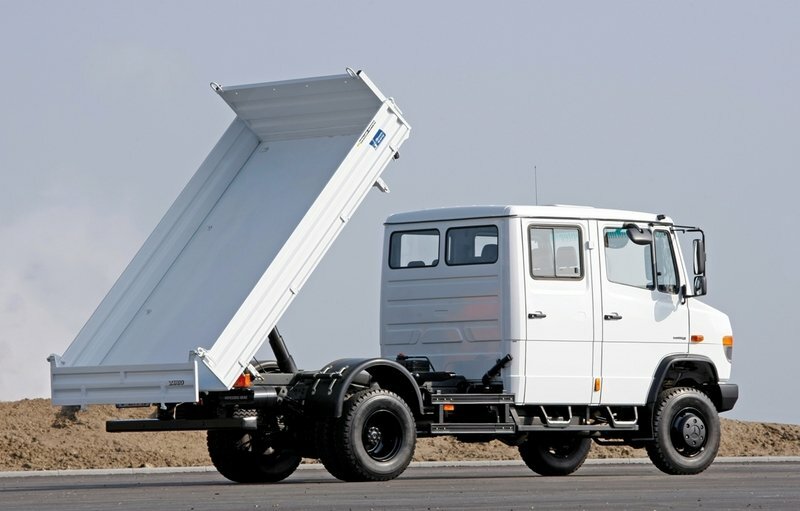 The dropside version of the Mercedes Vario features a load area of 6.92 m2 to 14.79 m2 with a payload capacity between 2.5 t -4.2 t, depending on model and weight category. The load platform is made of aluminum and all its three sizes can be dropped down completely for easy loading and unloading. For enhanced versatility, a ball-type trailer tow hitch and various pin-type trailer tow hitches are also available as factory-fitted optional equipment. The interior matches the utilitarian design found outside. The dashboard looks extremely simple and dull, without any fluid line or other interesting design element that worth to be mentioned and it can be perfectly described as being just a basic dashboard fitted with basic controls. The plastics aren’t something to rave about either and were selected firstly for their durability. The fittings however, look pretty good and the overall build quality is also surprisingly good. 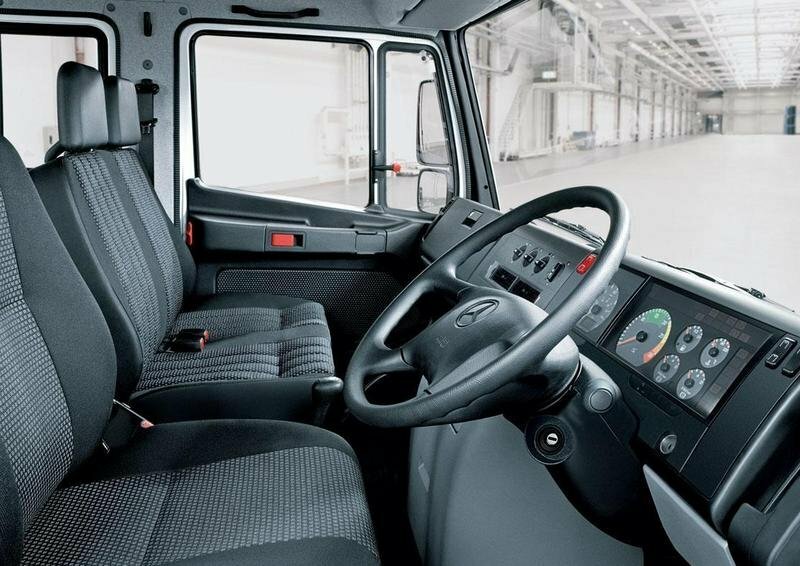 The cab’s ergonomy is also satisfactory with all the controls placed close to the driver’s seat. The instrument cluster is pretty basic and it will be hard to find a more clear and easy to understand unit at other vehicle in the segment. We like the steering wheel’s design, but we find a bit too big and intrusive. 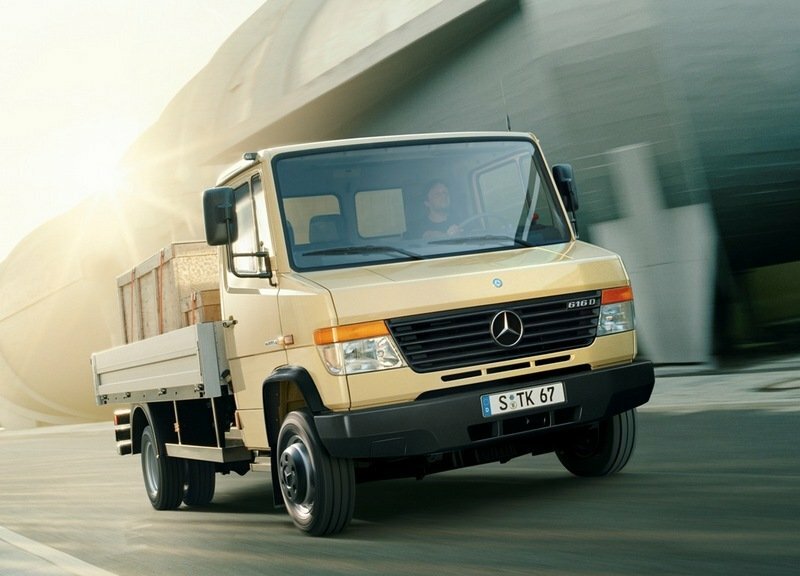 Unsurprisingly, the Mercedes Vario chassis cab offers acres of inside space and up front there is place for up to three people (crew cab model cab accommodate a total of up to 7 people). As it was expected the seats comfort isn’t exactly first class, but at least you have plenty of head-, shoulder-, belly- and leg-room at your disposal. We have to admit that the driver’s seat is a bit more comfortable, as it has adjustments for height, tilt, distance from the steering wheel and position of the backrest. The high driving position and the massive windshield offer a superb view of the road ahead, while the huge exterior mirrors provide proper side visibility. You’ll be surprised to see that the Vario falls pretty short when it comes to storage places and it’s a shame given its gargantuan size and the spacious interior. The Mercedes Vario is equipped with a four cylinder diesel engine with direct injection. The engine is available in three power ratings and is mated on either 5 speed manual or 6 speed automatic transmissions. 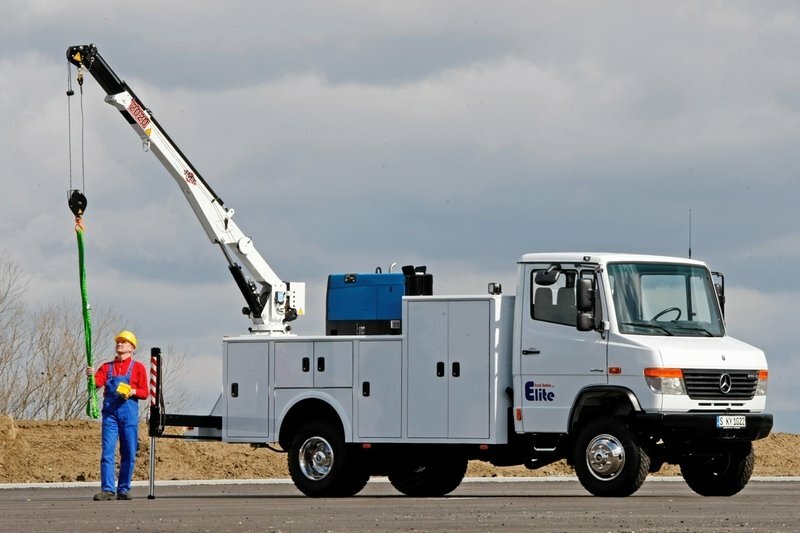 The engine offers plenty of punch to keep the vehicle able to deal with any commercial purpose and offers plenty of low end torque to have a proper towing capacity. Moreover, the engine is also among the most efficient units in its class and thanks to the BlueTEC SCR technology it complies with the Euro V emission standards. Besides the standard rear wheel drive version, the Vario is also available with a permanent all-wheel-drive system which offers better grip and delivers enhanced pulling power. For a proper traction the all wheel drive system features an engageable off-road ratio and when needed, both the differential in the transfer case and the rear axle differential can be locked. 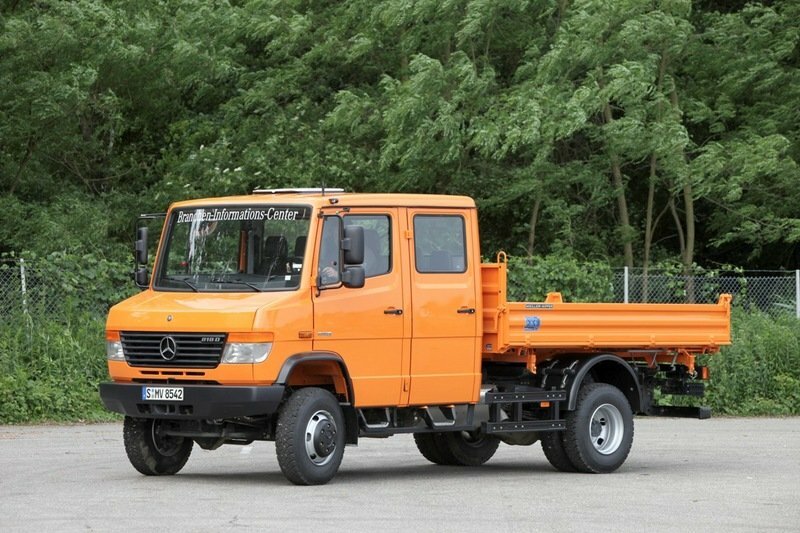 The Mercedes Vario chassis cab features a robust ladder-type frame and a strong chassis with rigid front and rear axles. There are also various different final-drive ratios for a variety of applications including an option with differential lock. To be able to tackle the most demanding payloads, the Vario received maintenance-free parabolic springs for both front and rear axles. As most vehicles in the segment, the ride is more on the bumpy side, while the tall stance and the relatively narrow width translates in a pretty big body roll. 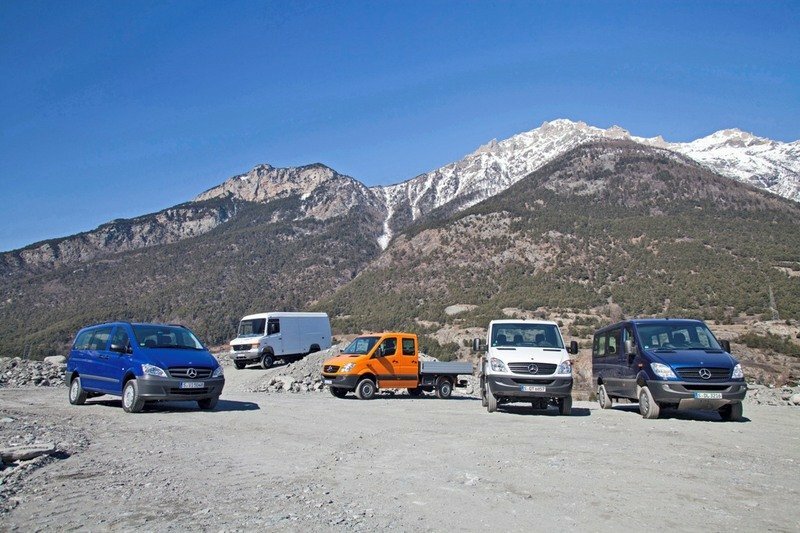 For a better ride however, the Mercedes Vario chassis cab is available with different versions of air suspension which can be also ordered with level control if needed. We don’t have any complains about the standard power steering, as is at par with its competitors delivering a sharp response without being overly light or unsettled. The stopping power is assured by a powerful dual-circuit compressed air/hydraulic braking system with automatic brake adjustment and all-round ventilated disc brakes with ABS to prevent the wheels from locking during braking. Other safety features include automatic, load-dependent brake pressure control (ALB) for the rear axle, engine brake, retarder, fog lamps, electronic imobiliser and driver airbag. 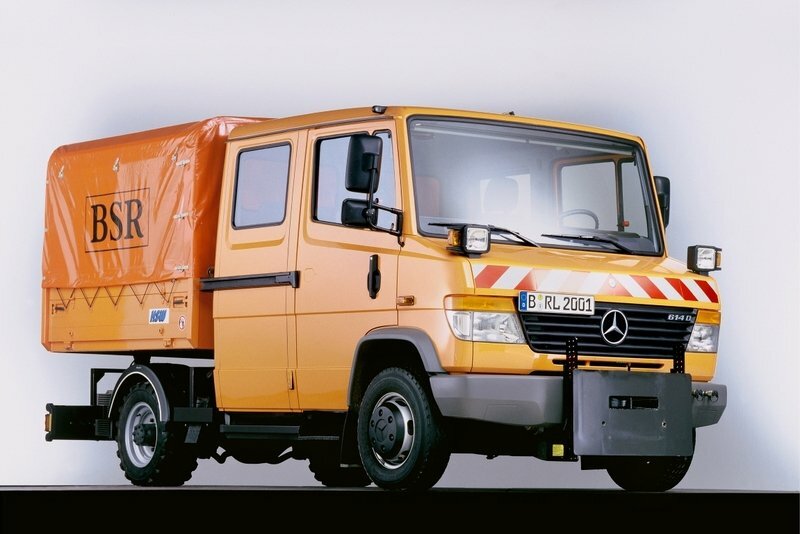 The Mercedes Vario is a very flexible commercial vehicle that copes great with a very wide range of applications. The truck’s design copes perfectly with its utilitarian nature and the overall build quality is also pretty good. Moreover, the Mercedes Vario is also equipped with one of the most efficient engines in its class and comes with both rear and all wheel drive systems for an enhanced versatility. The cabin is fairly spacious and even if it’s not the most comfortable in the business and isn’t fitted with any fancy technologies, it has all the basic equipment needed and also comes with a driver air bag that is a big plus in this segment.